Summary. Here I demonstrate the study of visual phantoms from Rosenbach (1902) to the latest novel findings (e.g. Craik-O'Brien-Cornsweet phantoms). It is suggested that the visual phantom illusion involves high-order visual processing, involving perceptual transparency. The visual phantom illusion refers to a phenomenon that an illusory grating appears to bridge the occluder that occludes a luminance-modified grating. When the luminance of the occluder is the lowest luminance of the grating, dark parts appear to be bridged or be continual. It is also characterized by the phenomenon that phantoms always appear in front of the occluder. 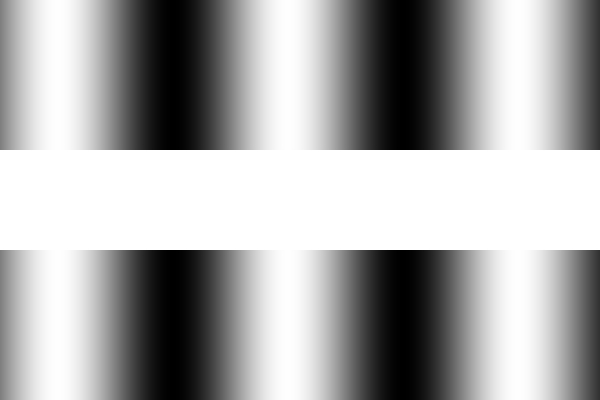 When the luminance of the occluder is the highest luminance of the grating, light parts appear to be bridged. Rosenbach, O. (1902) Zur Lehre von den Urtheilstauschungen. Zeitschrift fur Psychologie, 29, 434-448. Stationary phantoms are manifest when contrast of the inducing grating is low. Stationary phantoms are explained in terms of perceptual transparency, in which the surrounding grating induces counterphase lightness induction in the occluder (McCourt, 1994) and generates unique transparency that gives the continuation and the fixed depth of phantoms. The figures show the appearance of stationary phantoms (the upper image) and the explanation in terms of perceptual transparency (the lower image). Although it has long been thought that the visual phantom illusion is a phenomenon of visual completion of lightness, paradoxical phantoms shown below are not paradoxical in the context of perceptual transparency. Fusing the two figures, you see two lines of white phantoms in front of the black background. When the occluder is placed obliquely on a grating, completion occurs across alinged gratings as well as misalinged (vertical) ones for phantoms. On the other hand, for grating induction, completion occurs only across the latter. White phantoms frequently give the perception of mist. I think the perception of mist chiefly depends on visual phantoms. The perception of misty spirals is due to white phantoms. The perception of mist seems to be due to white phantoms. An example of Petter's effect, in which the thick vertical rectangle tends to be perceived in front of the thin horizontal rectangle. For visual phantoms, the less the spatial frequency of the inducing grating or the shorter the width of the occluder, the more visible the phantoms (the left image). On the other hand, the more the spatial frequency of the inducing grating or the longer the width of the occluder, the less visible the phantoms (the left image). This characteristic resembles that of Petter's effect. 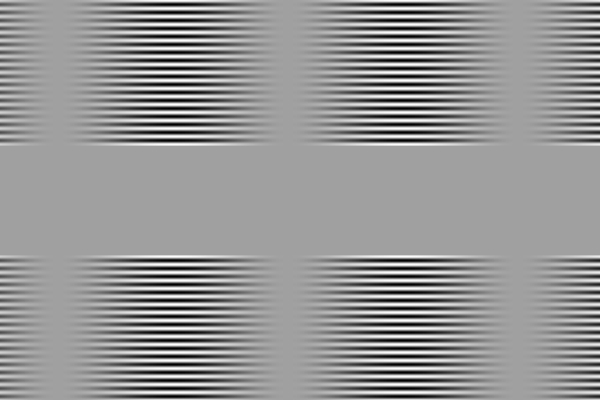 An illusory grating in phase with the inducing grating appears BEHIND the occluder. This phantom involves bistable transparency. Color is also completed in photopic phantoms. The illusory contours of photopic phantoms are more distinct when they have crossed disparity. For cross fuser, fuse the left and middle panel; for uncross fuser, fuse the middle and right panel. Even if the height of the inducing grating of photopic phantoms is decreased, phantoms remain. We call them "neon" phantoms because it resembles neon color spreading. Low-contrasted regions appear to form visual phantoms. Gyoba, J., Sasaki, H., & Sakurai, K. (2000). Visual phantoms can be produced by second-order gratings. Investigative Ophthalmology & Visual Science, 41, S228 (Abstract no. 1198). Fusing the two figures, you see a transparent square in front of the background. This means that regions of lower contrast tend to form phantoms. Phantoms appear between a luminance-modified grating and a contrast-modified grating. This is called "chimera" phantoms. Fusing the two figures, you see two lines of "mist" in front of the background. These are stereoscopic chimera phantoms. Mach bands (there are four) might be completed through the occluder. It appears that there are light and dark regions in the gray surround though they are actually of the same luminance (Craik-O'Brien-Cornsweet's effect). When an occluder is placed, photopic phantoms appear. This means that contrast polarity of photopic phantoms is not determined by the (physical) luminance of the grating but by the (perceived) lightness of the grating. This phantom illusion also suggests that contrast polarity of photopic phantoms is not determined by the (physical) luminance of the grating but by the (perceived) lightness of the grating. I think that surface color, not film color, is completed. It is known that stationary phantoms give counterphase lightness induction in the occluder, but phantoms show in-phase induction if the presentation time is shorter than about 150 ms. It is known that grating induction (McCourt, 1982) gives counterphase lightness induction in the occluder, but it shows in-phase induction if the presentation time is shorter than about 150 ms. When the presentation time is longer than about 150 ms, counterphase induction appears. These findings suggest that in-phase induction appears immediately after presentation, followed by counterphase induction. It is speculated that for stationary phantoms, in-phase components are masked by counterphase ones because the latter give stronger induction than does the former. In addition, simultaneous lightness contrast, White's effect, or Adelson-Logvinenko's effect appear immediately after presentation, suggesting that the mechanisms underlying those illusions are different from that of grating induction.